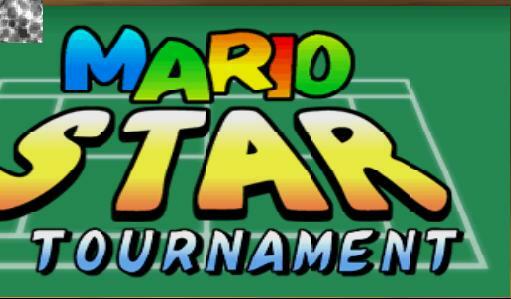 I think an interesting statistic would be: how many people laughed when they first heard Mario would be starring in a tennis game? Well, for one, I did. I thought it would be the worst game Mario had ever lent his name to (and I’ve finished Mario is Missing). I was wrong; it’s not the worst game ever. But not only that, it is also one of the most addictive games you will ever have the good fortune of playing. What I found even more surprising was that the pure tennis mode is where the most fun is had, and the ‘Bowser Stage’ and the ‘Ring Mode’ (more on those later). Since the whole game revolves around playing tennis, I’ll explain what tennis is for the few who were dropped as babies. It’s played on a rectangular court, with a net across the centre. The opposing players/teams must stay in opposite side of the net. One player hits the ball over the net. The other player hits it back. Repeat until someone misses, or hits the ball out of the court. Then repeat again until a set score limit is reached. As boring as this may sound, Camelot, the developer, have really done a good job making it a fast paced, fun game. There are realistic ball physics, but they travel faster than in real life, and all the controllable characters (expect for the ones made deliberately hard to control, to balance out their powerful shots) move around quickly and easily. Altogether there are 16 playable characters (if you don’t include the extra ones you get for linking up with the GB version), and the differences are not just cosmetic. They all play noticeably different from each other. As always, Mario and Luigi are the all rounders. Wario, Bowser and DK are the slow runners, but powerful hitters. Toad, Yoshi and Peach are the fast court sprinters. Waluigi, Wario’s brother, is tall and lanky, making it easy for him to hit high balls. Boo and Paratrooper, since they fly above the ground, have little traction and are hard to control, but they have shots that turn in mid air. Very hard to return the ball when they are serving. There are an amazing number of shots for a game that uses two buttons. Pressing ‘A’ will give you a high shot; ‘B’ will give you a low one. ‘A’ then ‘B’ does a lob, ‘B’ then ‘A’ does a drop shot. Pressing a button twice before the shot will make it more powerful, and you can even charge the shot, for more power, by holding down the button. Aiming the ball is as simple as pointing the control stick in the direction you want the ball to travel. Pointing the control stick up and down will speed up and slow down the ball. When all of this is combined it creates a great tennis experience. 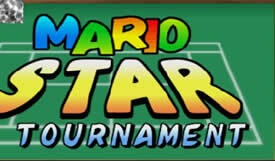 There are four game modes to choose from: pure tennis, ring shot, Bowser stage and piranha shot. Piranha shot is the only mode that can’t be played in multiplayer. It’s pretty much a challenging practice mode, with three piranha plants at the base line of the opposite court. The piranha plants shoot balls at you, with the idea that you hit them back, without your opponent being able to reach it. Obviously this gets boring very quickly and you will probably spend the least time here. The Bowser stage is suspended over a lava pit (although you can’t fall in) with chains holding it up. The court can tip and turn depending on where the players are standing. There are also pickups a la Mario Kart 64. Lightning, bananas, shells and stars are all there. This sounds great on paper (or on a monitor), but the novelty value wears thin pretty quickly. You will only play about five matches before you leave it for good. The only variation that you can keep coming back to is the ring shot mode. Rings will appear around the net and you have to hit the balls through them. In single player you have to get as many rings as possible. In multiplayer it is quite different. You have to stop the other players from winning the point, because if they do then they win all the rings earned during the point. This mode is great fun any way you play it. The graphics in Mario Tennis are simple compared to most of the later N64 games. The models have low polygon counts and have textures that are brightly coloured without much depth. All this is not actually a bad thing because it allows for a consistently high frame rate, which for a fast paced game like this, is a must. 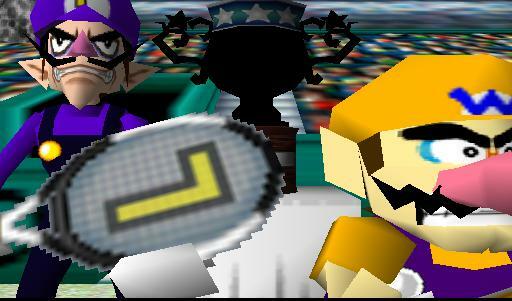 For all the time I’ve been playing Mario Tennis I’ve never noticed a drop in framerate. 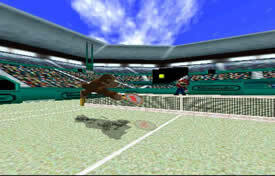 A feature which I particularly like about Mario Tennis is the replay. To keep things simple there aren’t any controls for the replay (apart from quit and rewind). After every point a replay is shown (or you can skip it if you don’t want to see it) highlighting the end of the point, with great angles. If you’ve done a charged up shot to win the point, that shot will be shown from different angles. Sometimes there is a ball chase cam. Altogether it creates great effect. So far I haven’t said any bad points about Mario Tennis. This is because there aren’t many. Apart from the disappointing bonus modes, this game has been put together perfectly. Mario Tennis is a must for anyone with a brain (sorry Macca) and friends (sorry Quvack). 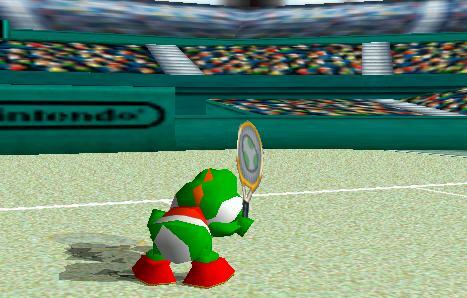 UPDATE: On the emulation side of things, Mario Tennis runs on 1964 and PJ64 using Jabo's D3D plugin 1.4. Although there are some pretty major graphics bugs, then game is playable. I found PJ to run the game very slowly, while 1964 ran it at a slightly slower than N64, but still pretty fast. 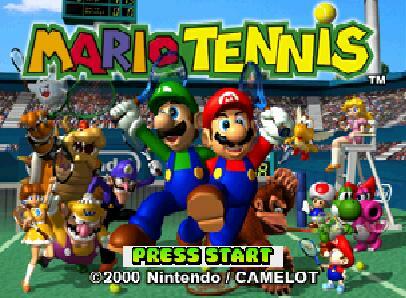 Anyway, the whole point of Mario Tennis is the multiplayer, so you really need to play it on a N64.